Michael D. Moore became the “man of the house,” at the tender age of eleven due to the divorce of his parents. He readily assumed that responsibility and sought a way to fulfill his newfound responsibility by becoming one of the breadwinners in the family. Michael the entrepreneur was born. He started collecting cans and selling them and going to the gas station when it rained, helping patrons by pumping their gas when they didn’t want to get out of the car. When that wasn’t enough, he started knocking on the doors of his neighbors in his third ward Cuney Homes apartment complex asking them if he could take out their trash for some change. Michael or “Moe” as he was known in high school was relentless in his hustle, which began to shape him as a small businessman. This perseverance garnered him the title of an All American/All State football player at Westbury High School and later he became an All American Fullback at North Iowa University. His football career came to an end when he transferred to Prairie View A&M University, but the principles he learned as a businessman helped him make the difficult decision to leave college rather than accumulate a debt that would take a lifetime to pay back. With $460 from an unemployment check, he founded Beltway Records and built this business to become a prosperous company generating a six figures annual income. While traveling across the country dining in five star restaurants and hotels, he became impressed with their presentation and quality of the food he enjoyed. This prompted him to begin to experiment with mixing different kind of seasonings. Desiring to always be the best “Moe” he could be, he started reading self-help books. One book in particular resonated with his soul and prepared him for his encounter with destiny, The Magic by Rhonda Byrne. An opportunity for him to showcase his seasoning came to him one day through a friend. His initial reaction was hesitancy until he heard his “second voice,” encourage him to take the challenge. He distinctly heard the words, “Go, because there is something out there for you.” The day of the event was fast approaching, but the weatherman had predicted rain on the day of the Crawfish Contest. He felt that he’d gotten a reprieve, again the voice (Michael calls it the “voice of God”) told him to persevere. He did and his whole destiny changed. Moe wowed the people! His newly acquired favor with his culinary audience won him a spot in the next round. He won the contest because the crowd loved his blended seasoning creation. On his trip home from the event, he had an inner witness that he had truly meet destiny that day. Moe took another step of faith and began to build a company around the seasonings. He took full advantage of this newfound opportunity and called his graphic designer to put the vision in place; Moe’s Crawfish Magic Dust was born. After that, Moe went through the trial and error of creating the perfect spice. He would spend countless hours in a self-built seasoning office located in his home. Moe was determined to come up with the best blend on the market. Leaning on his talents as a Chef and a Bar B Q Pit Master helped with the art of blending seasonings and after only one year of dedication and careful testing, Moe did it, and he knew it. Once he completed the task of perfecting his special blends, he decided that he needed to design the perfect package. Two packages later, he finally decided on the one he felt was right. And it was perfect. What Is Special about Moe’s Magic Dust Seasonings? This seasoning is like no other. First of all, it is low in Sodium and Salt, with a fabulous blend of herbs and spices. Plus, the seasonings taste differently on each dish you prepare, never compromising taste or quality. The different seasonings have a unique way of reacting to the foods, enhancing the flavors without overpowering or masking them. Moe really has taken the mystery out of aspiring cooks and seasoned experts in the kitchen trying to blend seasonings to create a tasty dish. He now has several different seasonings (Moe’s Magic dust for Creole Cuisine, Southern Cuisine, Seafood Cuisine and Cajun Lemon Pepper) that are located in grocery stores across the country. He got a chance to enter the grocery store market after sharing some of his seasonings with a local manager at Pyburns Farm Fresh Food. He approached a Vietnamese store manager about putting his product in the store and left him a sample. Two weeks later he returned and the store manager appeared puzzled when he approached him. Moe thought it was a language barrier that was breeding the confusion, but the man was just astonished by the seasoning’s robust flavoring. He eventually found his voice and said, “I tried that s___, last night on my chicken and it was great!” Needless to say, Moe’s Magic Dust found a new home and the rest is history. Moe attributes his business acumen to three local Houston business owners: Roy Malonson, Don Middleton, and Hai Bui. Malonson called him to help prep another company with a great product called Purple Pickle to launch into the food industry. Moe remembers meeting Malonson through his daughter in high school and thinking to himself, “That’s me when I get that age.” Middleton, the head of the Black Rodeo Commission invited him to be a part of the organization after seeing the excellent packaging of Moe’s Magic Dust. He has mentored him by introducing him to his sphere of influence and opening doors for his business expertise. Bui and Moe share a love for social activism and joined forces on the several local projects. He attributes his love for community to Bui because he helped him transition from a music business mentality to becoming a community advocate. 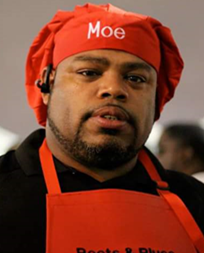 Moe’s future is booming with entrepreneurial possibility, he is branching off into pork skins, barbecue sauces, seasoned rice, canned goods, seafood batters and a whole lot “Moe.” Within the last two years he has opened two restaurants, The Stuffed Baked Potato Factory, which was inspired by the success of Moe’s Magic Dust. He even has an app for iPhones and androids where you can order your food to go. Couple Moe’s entrepreneurial savvy with his perseverance and there isn’t anything that he can’t accomplish. To think, this all started when a little boy decided to accept the challenge to wear the big shoes of the man-of-the-house. Michael D. Moore (Moe) is an inspiration to his family, community and to his fellow entrepreneurs. Not bad for a little boy from Cuney Homes!